Chestnuts roasting in the fireplace, to be eaten with a warming glass of Rosso Piceno Superiore, full-flavoured sausages with a steamy bowl of lentils, and zesty mandarin oranges - welcome to the winter edition of the Marche Voyager Newsletter. And a Buon Natale e Felice Anno Nuovo to you all. The wine award season has again brought an abundance of prizes for winemakers in the Marche. A total of seventeen wines managed to win Gambero Rosso's prestigious Tre Bicchiere award for Italy's finest wines, thirteen of which were outstanding examples of verdicchio. The Slow Wine 2012 guide from Slow Food meanwhile gives special praise to a number of Marche producers, and includes a useful listing of wines that offer particularly good value for money. "An eye from your head", as Italians say meaning "an arm and a leg", is what you'll have to pay this year for a taste of white truffle (Tuber magnatum pico). According to the Acqualagna Borsa del tartufo, or Truffle Exchange, the current price for these delicacies is an eye-watering Euro 3,500 a kilo. Expect bills in restaurants serving tartufi bianchi to be heavily "seasoned". Cost cutting measures announced by the Italian government might well mean saying addio to two of the region's five provinces. In plans yet to be finalized the current 86 Italian provinces would be reduced to 51; in the Marche while Pesaro & Urbino and Ancona would remain unaltered, Macerata, Fermo and Ascoli Piceno would be fused into one. Maybe not a bad idea to use the old Roman name Picenum for the southern part of the region? Despite a notable drop in tourism throughout Italy, the Marche has managed to keep its head above water according to recent figures from the region's tourist board. While there was a -5.6 percent drop in the number of tourists in Italy in the first six months of 2012, the Marche showed a modest increase in arrivals of 0.83 percent on the same period in 2011. 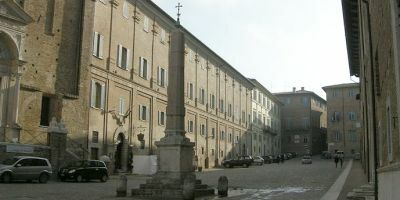 This month's image of one of the region's piazze, or town squares, features Piazza Rinascimento in Urbino, watched over by one of the fifteen ancient Egyptian obelisks in Italy. The red granite obelisk was originally erected by the pharaoh Apries at Sais in Egypt in around 580 BCE before being carted off to Rome in 90 CE. It was given to Urbino in 1737 to commemorate the Urbino-born Pope Clement XI. Even the humblest Christmas cribs celebrating the nativity of Christ feature some kind of working model, say, of a mill wheel turning or a blacksmith hammering in his forge. But those in love with the world of model railways should make for one of the region's presepi meccanici, or mechanical cribs. Two of the finest examples of these can be seen at Colmurano, in Macerata province, and Fano, in Pesaro province. Both can be visited from Christmas day until 6 January. The Marche character owes much to the hard-working and cunning contadini, or sharecropping farmers, of the past, and a number of museums keep alive their memory. The best known include the Sergio Anselmi museum in Senigallia, and rural life museums in Montefiore dell’Aso, Morro d’Alba, Pieve Torina, Sassoferrato and the Biroccio, or farm cart, museum in Filottrano. Roads connecting the Marche with neighbouring regions to the west cross the barrier of the Apennines by way of six main passes. From north to south: Bocca Trabaria (Urbino-Arezzo), Bocca Serriola (Fano-Città di Castello), Passo della Scheggia (Fano-Perugia), Colle di Fossato (Fabriano-Foligno), Passo di Colfiorito (Macerata-Foligno), and Forca Canapine (Ascoli Piceno-Norcia).